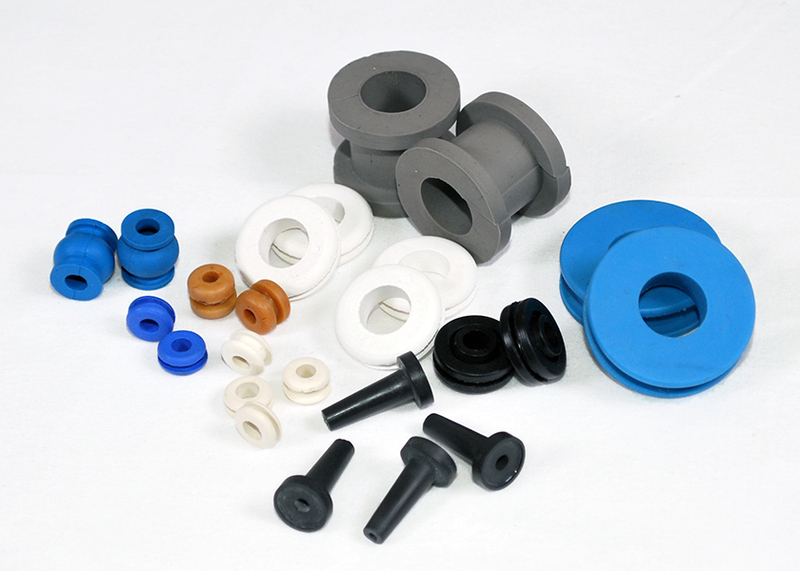 Minor Rubber manufactures a wide assortment of high-quality rubber grommets to fit most industrial applications. We maintain an extensive inventory in various sizes and materials to meet your specific requirements. Many styles are available in more than one material or durometer hardness. Grommets are useful in electronics applications when a wire or tube needs to pass through metal or another material that may cause damage. Most commonly, they protect cables from sharp corners and edges. We offer standard insulation grommets in Buna-N, and we also manufacture Mil-Spec grommets for military applications, vibration mount grommets to protect components from noise & vibration, and other specialty grommets. Grommets can be pushed into place using our grommet inserter tools. Most of our stock grommets are made from Buna-N (Nitrile), however, we also manufacture custom grommets in a range of materials. For example, we use commercial grades of SBR, silicone, Neoprene® 1, and EPDM. Materials are available in commercial and specification grades including NASM 3036 Composition A and B, Mil-Spec, ASTM, AMS, SAE, and others. At Minor Rubber, we are able to manufacture grommets in a variety of shapes, including oval, square, rectangular, oblong, and round grommets. If you are not sure what grommet shape is best for your application, contact Minor Rubber and we can make a recommendation. In addition to electronics applications, our grommets can be used in a wide variety of industries including aerospace, healthcare, construction, transportation, and defense applications. We serve the OEM and replacement part markets, maintaining inventory for industrial distributors. We have earned a reputation for high-quality manufacturing, so call today to see how we can assist you.